The last two words in the post title is what made me really want to take this bus; one can see the Tobin Bridge from literally miles away because it's so high. When I first saw the 111 on a map, my first thought was "A Key Bus Route that goes over the Tobin? Sounds good to me!" Despite running often, my father and I never really got a chance to take it for a while. Finally, we had a free Sunday, so we set off for Haymarket Station. Turns out it's a good thing we rode this bus on a Sunday. There had to be at least 50 people at Haymarket waiting for the bus. If it's like this on Sundays, what are the crowds like at rush hour? I've heard stories of the bus having to leave people behind because of its crowding. Being in the city, there are relatively tall buildings as the bus travels down North Washington Street. After passing a little tennis court, the bus goes over the Charlestown Bridge. Even this is a good view, but the best part is soon after. The bus turns off the Charlestown Bridge (called New Rutherford Ave at this point) onto Route 1, which becomes the Tobin Bridge. I can see how people wouldn't like going over the bridge, as it's extremely old and it feels like it's going to collapse at any moment. It also provides an amazing view of a body of water and neighborhoods in Chelsea. I'm sure you get a great view of the city travelling towards Haymarket. The bus turns off Route 1 soon after and serves Bellingham Square. This is a major bus stop, serving two other Key Bus Routes and two non-key routes. It goes pretty close to the Chelsea Commuter Rail station, and then serves Cary Square. This is where the occasional 111 ends (it would be marked "111c"), while our bus turned to stay on Washington Ave. It's still very urban here, but what was businesses and apartments is now just regular houses. 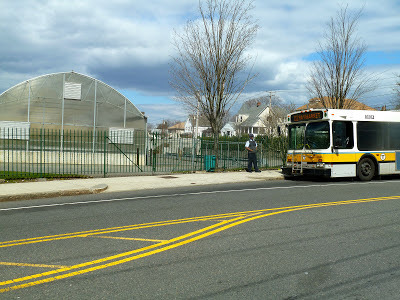 The bus crosses over Route 1 and then turns onto Sagamore Ave and again onto Garfield Ave. Garfield Ave meets up with Washington Ave again, and the bus continues, paralleling Route 1. The bus turns onto Elm Street and reaches "Woodlawn," just on the border of Everett. Woodlawn is actually sort of in the middle of nowhere. My father and I were the only ones who stayed on until here, and there really wasn't much. In the immediate surroundings, there's a weird industrial building, Woodlawn Cemetery (hence the name of the terminus), and some houses. It's actually rather uninviting, but there are some businesses quite close to the stop. We didn't get to try any of them, however, as a 110 came (review coming at some point) and we continued our journey. WHERE ARE WE (the 111 at Woodlawn)?! Ridership: Many, many people use this bus as a link from Boston to Chelsea. I mean, many people use this bus. Even on a Sunday, we were packed in like sardines. On our ride, almost everyone got on at Haymarket and slowly drained out as the ride progressed. By the time we reached Elm Street, my father and I were the only two people on the bus. Pros: A great, frequent link from Boston to Chelsea. Absolutely wonderful headways: every 5 minutes rush hour, every 12 minutes midday, every 10 minutes nights and Saturdays, and every 14 minutes Sundays. 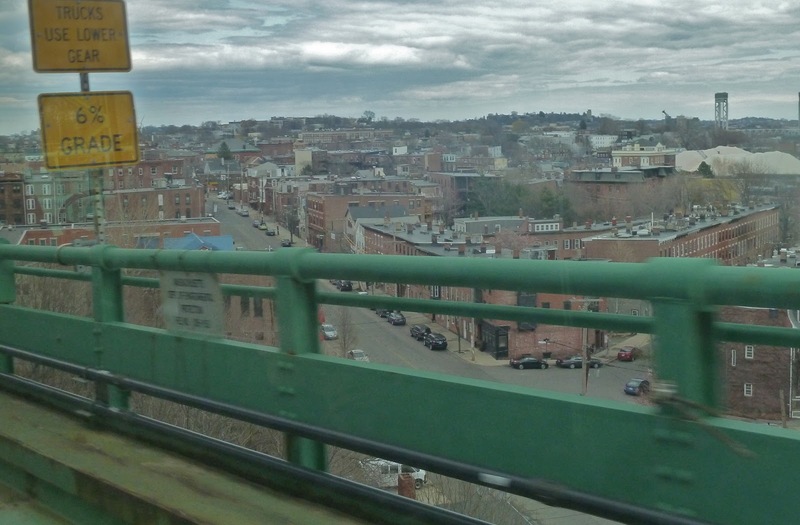 The Tobin Bridge views are amazing, and the bus is worth taking just for that. It's also a rather hilly route, which are always fun. Cons: The crowding. This bus would greatly benefit from using articulated buses, although they might get in the way of traffic on the Tobin. Also, this bus might soon become unnecessary. See below. Nearby and Noteworthy: I feel like I'll be saying this a lot in posts to come: I'm sure there are many great things to see and do along the route, but I experienced none of them. The Tobin Bridge is pretty noteworthy, I suppose, but that's all I got. 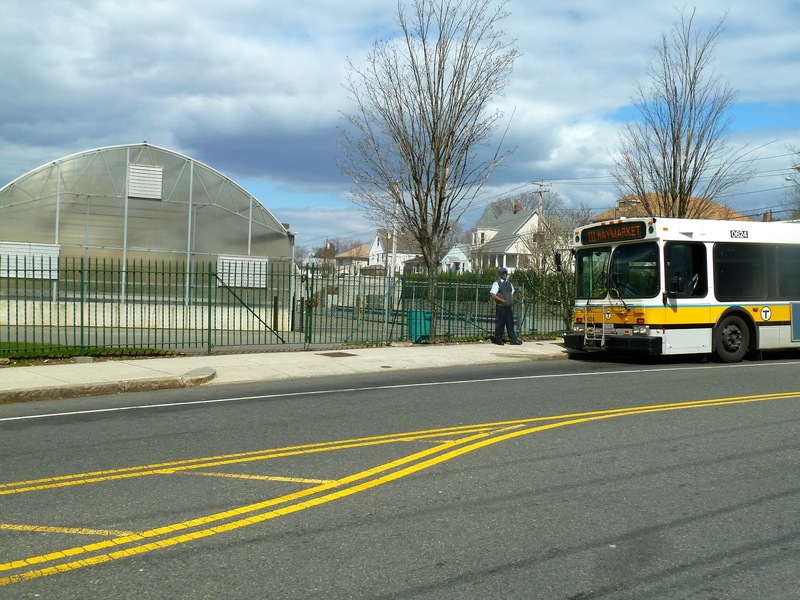 This bus offers amazing views, and it serves a lot of neighborhoods that need transit. But the crowding is simply awful. If it's packed to the gills on a Sunday, then I'd hate to ride this bus at rush hour. Also, this bus won't even be necessary in a few years if the MBTA decides to build the Silver Line Gateway. It would be a Silver Line to Chelsea that would probably reduce the crowding on the 111. I don't entirely agree with the planned route, however. It would start in the transitway at South Station and follow the SL1 to the airport. However, it would skip all the airport terminals and then serve Airport Station. After that, it would go on to Chelsea. I just don't see the point of making a connection the SL1 doesn't offer, but not serving the airport terminals. That's just my opinion. 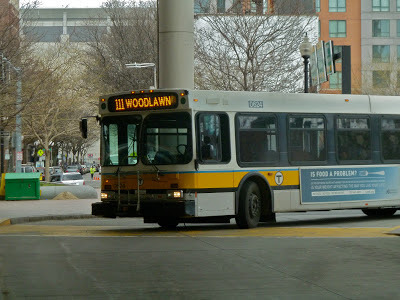 Latest MBTA News: On Sunday and Monday (June 2-3), there are buses replacing the Blue Line from Suffolk Downs to Wonderland from 9 PM to the end of service. There are also buses replacing the Red Line from JFK/UMASS and Quincy Center on June 1-2 and June 8-9 from start to end of service. There are many bus service changes, but too many to list here. Use this link and scroll down to "advisories." 6? You rave about this bus and then give it a 6 because it's crowded? I don't know if you figured this out but a crowded bus means a successful bus. A crowded bus route is a healthy bus route. The success of public transportation relies on busses that get used. If the bus was empty would you have given it a 10? Well, not necessarily. I consider a successful bus to have many, if not all of the seats full and maybe a few standees. If a bus is bursting at the seams or even leaving people behind like the 111 does, it's just painful to ride. Sure, I'll probably lower the score if the bus gets barely any ridership, but success isn't the only factor that goes into scoring. Would you want to ride a bus with 200 people in it? Well, that's a matter of opinion, I suppose. A successful bus, huh? Cuz it's packed..? It's jammed with illegals like a chicken bus in Honduras who refuse to move back in the aisle although there are people waiting to get on. Morons. I stand and wait at the Arlington Street stop some days as bus after bus doesn't stop because it's FULL! Sometimes I have to walk to Bham square and take another bus to Maverick.. But in terms of ridership, it's very successful. I suppose it's a bad experience for the commuter, but it's great for the MBTA. However, again, it's a matter of opinion. The SL3 combined with the SL1. Uhh, imagine the 111 combined with the SL1. That is what it would be.